The Maldivian government has said that the eligibility to run in the upcoming Presidential Election for ex-President, Mohamed Nasheed will be decided by the Supreme Court of the Maldives and not the United Nations. 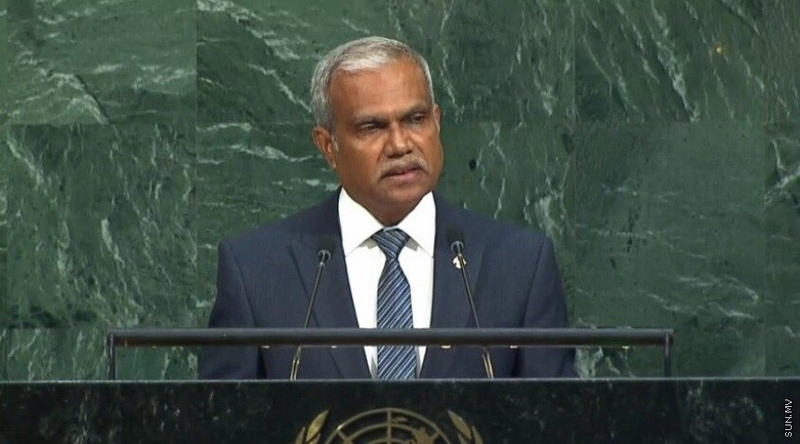 On 4 April, United Nations Human Rights Committee decided that the former President Mohamed should be allowed to run in the Maldivian Presidential Election. The committee today released the report on the decision. A state issued by the Foreign Ministry said that the government rejects the views adopted by the Human Rights Committee on 4 April 2018 regarding the complaints filed by former President Mohamed Nasheed alleging the violation of his civil and political rights. "The Government accepts the conviction of Nasheed as lawful and final. The conviction has reached finality after the decision of the Supreme Court on 27 June 2016. The Government notes with concern that although a detailed submission was filed in response to the complaints, very little, if any, consideration has been given to those submissions. Having attempted to subvert the course of justice and dismantle the judicial branch of the State, both while in Office and since leaving it, former President Nasheed was charged for having ordered the abduction of a sitting judge. President Nasheed had confessed through various public statements, both in local and international forums and via media, that the arrest of the judge was in response to his wishes and that he would do it again." The Foreign Ministry statement said. The government statement said that the Maldives is committed to promoting and protecting the rights enshrined in the Constitution of the Maldives and in the International Covenant on Civil and Political Rights as per it’s international obligations, and wholeheartedly refutes that any of these rights have been violated in the case of the former President Nasheed. "The Government accepts the conviction of Nasheed as lawful and final. The conviction has reached finality after the decision of the Supreme Court on 27 June 2016. The Government notes with concern that although a detailed submission was filed in response to the complaints, very little, if any, consideration has been given to those submissions." The statement said. The statement also referenced that Article 109 of the Constitution of the Maldives that details the qualifications a person elected as President must hold, and as such, Article 109 (f) states that such a person shall not have been convicted of a criminal offence and sentenced to a term of more than twelve months, unless a period of three years has elapsed since his release, or pardon for the offence for which he was sentenced. Since Former President Nasheed was convicted on 13 March 2015 and sentenced to 13 years of imprisonment, he would not be eligible to run for the Office of the President unless a period of three years has elapsed since his release or pardon. The Maldivian Government assured that Maldives and its State institutions are committed to holding free, fair and credible Presidential elections in early September of this year and the Government wishes to assert that elections can only take place as per the provisions set forth in the Maldivian Constitution and relevant electoral laws. "The Government is committed to working with all domestic and international stakeholders to improve institutional frameworks and to ensure a stable and peaceful environment with all candidates that qualify as per Maldivian law. The Maldives also welcomes constructive engagement from United Nations, its offices, and all its treaty bodies."